[Satnews] NSR’s Satellite Operator Financial Analysis (SOFA), 5th Edition, published today, finds that as GEO-HTS payloads continue to become more prevalent, satellite operator business models are encountering dramatic effects, including altered CAPEX cycles, lower backlogs, and falling revenues per transponder. “GEO-HTS payloads have had a dramatic impact on CAPEX cycles of satellite operators. We now see operators being able to minimize CAPEX by investing in one big GEO-HTS payload rather than 2-3 FSS satellites, and still end up with more capacity, which in a vacuum is a good thing,” states Blaine Curcio, Senior Analyst and report author. “What we’ve not yet seen is the end result—do our traditional FSS satellites with transponder counts in the dozens just become obsolete? Or is there still value in having 30 traditional transponders on a satellite, a few orbital slots away from one that has 300? These questions become important when even the 30 transponder satellite is, on paper, a $250M asset,” adds Curcio. The above scenario becomes especially appealing when operators have significant debt loads—i.e. Intelsat or Telesat—or when the operator has few traditional in-orbit assets to lose—i.e. a new market entrant such as YahSat or Avanti. “We are starting to see the impact that GEO-HTS payloads can have on revenues. Thaicom sees over $100M per year from IPSTAR. YahSat’s revenues per operational satellite metric exceeds $100M, and Avanti sees >$40M revenues per satellite at a self-admitted 20-25% fill rate. These are huge numbers compared to anything that a traditional FSS satellite could come to expect, and this is still only the beginning”, says Curcio. NSR’s Satellite Operator Financial Analysis, 5th Edition, provides industry-leading analysis and comprehensive research on all aspects relating to the financial side of the FSS and MSS sectors. With financial data taken from 8 fully-reporting operators, 8 partially-reporting operators, and 11 other operators from which data was derived from industry-recognized sources, SOFA5 is unparalleled in its level of detail and scope of data, supplemented by unique NSR analysis and insights. With over 200 tables and charts, and data from 2008 to H1 2015, SOFA5 is the definitive tool for understanding the answers to strategic questions surrounding the financial side of the FSS and MSS sectors. Satellite Operator Financial Analysis (SOFA), 5th Edition,is a multi-client report now available from NSR. The past year has seen the finances of the satellite telecommunications industry turned upside-down. Venture capital of the magnitude of hundreds of millions of dollars flowed in, and constellations with price tags in the billions were announced on what was seemingly a monthly basis. With this increased interest comes increased volatility, scrutiny, and competition. NSR’s Satellite Operator Financial Analysis, 5th Edition (SOFA5) report takes a critical look at the financial standing of the world’s leading satellite operators, with this year’s edition expanding to include MSS operator financial analyses. Combining comprehensive real-world financial data from all available operators with NSR’s signature, industry-leading holistic approach to analysis, SOFA5 offers a snapshot of the satellite telecom industry’s financial standing today, and how it will change in the future. What are the driving factors behind revenue growth of the industry’s fastest-growing players? How have fundamental shifts in industry CAPEX cycles altered the financial position of satellite operators? What might the impact of a LEO-HTS constellation be on the financial health of operators? How concerning is the decline in revenues seen by some of the industry’s leading players over the last few years, and what can be done to mitigate subsequent risk? 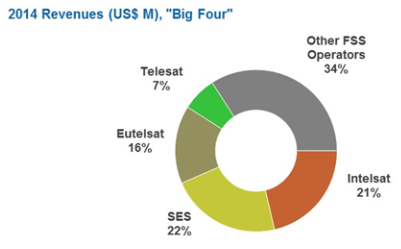 Will consolidation continue in the satellite industry, or can regional operators return to the previous trend of seeing healthier revenue increases than the Big Four? Bottom Line: Which operators possess the best overall financial health today? Which operators are improving their position, and at the expense of which competitors? Building on our four previous SOFA reports, NSR provides an objective and comprehensive analysis of the financial health in recent years, and future trajectories of satellite operators worldwide. 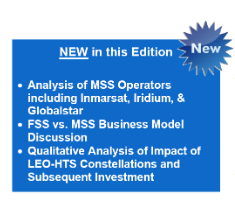 With this year’s edition expanding its coverage scope to include MSS operators Iridium and Inmarsat—the two of which account for over $1.5 billion in revenues—the comparative and standalone analyses offer more insights than ever before. As the analysis of GEO-HTS and Non GEO-HTS supply, demand, and business model development, NSR likewise offers comprehensive understanding of the very complex dynamics of these rapidly expanding market segments. Through extensive analysis and coverage in other studies, NSR has built a significant library of information from which SOFA5 derives its Non GEO-HTS and GEO-HTS business model discussions. With considerable depth and breadth of financial data, NSR’s SOFA5 combines quantitative operator information with qualitative metrics and industry interviews to paint a thorough picture of today’s financial landscape. Drawing data from extensive databases, the report proves an excellent guide for anyone looking to gain a more thorough and objective understanding of the financial aspects of a multi-billion dollar industry.